1. An improved appetite. Older dogs often get finicky about eating in their old age. Besides getting creative with food choices, Reiki is a wonderful way to support senior dogs when they just don’t seem interested in food. Many times, I’ve had the beautiful experience of the dog going over to his food bowl and finally choosing to eat, either during or just after a Reiki session. It’s amazing! 2. Physical and emotional comfort. 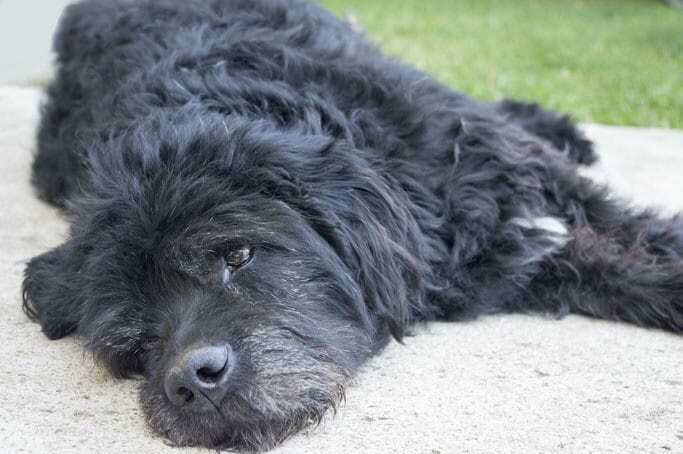 Old dogs deal with a multitude of unsettling physical symptoms, either from disease or just old age: an unsteady gait, a tilted head, nausea, arthritis, deafness and blindness—to name a few. Sharing Reiki sessions can address these issues and help dogs feel more comfortable in their aging bodies. When Dakota suffered from a bout of vestibular disease when he was about 12, I remember sitting with him and sharing Reiki. Although it was very difficult to see him struggling, sharing a Reiki meditation with him each day gave me a way to keep a positive mental focus of peace and healing. He improved much quicker than the vet expected, and I was able to keep a much calmer state of mind throughout the healing process. This article offers some tips on keeping a positive state of mind while sharing Reiki with your animals. 3. Renewed sense of connection and belonging for the dog. Blindness and deafness can lead to fear and a sense of isolation. Dogs with one or both of these issues may begin to lie on their beds all day instead of interacting with the family. This is where Reiki can play a very important role. Reiki shows us that connecting with our hearts is a profound way to communicate with and relate to our dogs. Reiki meditation is about connecting from the heart. We learn to breathe and focus into the heart of our being, to uncover the central core of who we are. When we remember our inner heart, we realize that although we often rely on our eyes and ears to connect us to our world, these senses don’t define who we are. When these senses dim, Reiki helps us to heighten our most important awareness—the awareness that comes from an open heart—in order to stay connected. Reiki shows us that connecting with our hearts is a much more profound way to communicate with and relate to our dogs! 5. Additional support during hospice. I remember how devastated I was when my dear companion Dakota was diagnosed with lung cancer at the age of 16. I did everything I could to help him—including sharing Reiki with him every single day. Reiki was a wonderful way to improve his comfort level during hospice, as well as my own mental/emotional state in caring for him. Our gray-muzzled companions benefit greatly from Reiki, especially as they age. So much inspiration in my work comes from the elderly animals at BrightHaven holistic sanctuary and hospice; all of them were given up on by someone else before they made their way to this special place, where they can live out their lives naturally and in peace. You can read more about their Reiki program here. How has Reiki helped your senior dog navigate the journey of aging? This article was originally published in the March/April 2016 issue of Dogs Naturally Magazine. My 13 year old Lab suddenly came down with a heart condition that was filling him with fluid. I had been doing Reiki with him for some time, and the night before he died I sat up most of the night giving Reiki. It was the least I could do for my gentle companion. I think I helped make his passing a little easier. I have shared once before that I got into Reiki because of my senior dog Charlie who was 17 at the time. I know that this gave me comfort as he got more shakey on his legs. It also gave great comfort when he passed. April, almost 16 loves when I meditate and have a reiki session. Bailey 13, just had 5 teeth removed yesterday. He was in such pain even after medication. So today I gave him some reiki and he rested his little head on my hand and was so peaceful, no crying, just deep breaths. It is a wonderful gift to share with our beautiful animal family. Thanks for sharing Ann! It’s beautiful that you have so many seniors to share Reiki meditation 🙂 Great to hear all the wonderful responses they have too! Blessings! Thank you so much for this article. It was as if I was shown this for a reason. My English bulldog, Rosie was just at the ER Vet last week. She had seizures. She is home now and so anxious and will not get settled. I’m trying to be patient and give proper time for the seizure medicine to adjust to her body. I do know Reiki, and she was a main reason why I learned Reiki. Lately I have been so caught off guard and so worried for her that I forgot about this wonderful gift of Reiki that I can share with her. Thank you for the reminder. It will bring me and her some needed peace. You have completely inspired me thank you so much this is what I plan to do with my life. Thank you for all that you do.